This section introduces the INSET statement with a basic example showing how it is used. See the section INSET and INSET2 Statements in Chapter 13, The SHEWHART Procedure, for a complete description of the INSET statement. The ODS GRAPHICS ON statement specified before the PROC CUSUM statement enables ODS Graphics, so the cusum chart is created using ODS Graphics instead of traditional graphics. 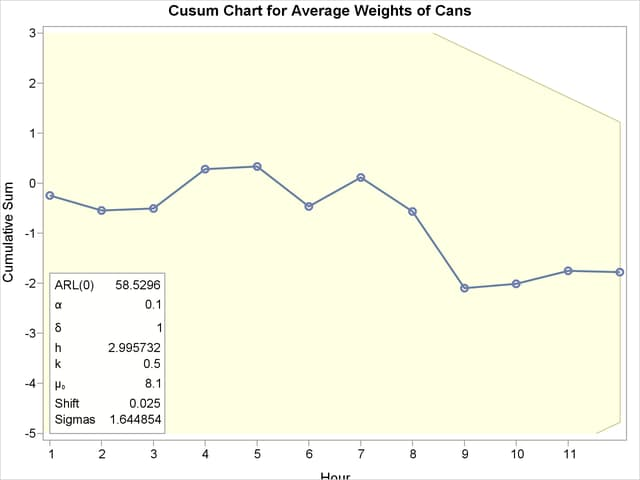 The resulting cusum chart is shown in Figure 6.3.2.